An Aussie mining company and its British millionaire-backer announced that they will pull out of the deadly proposed Xolobeni titanium mine, but it is unclear if they could still profit from the project through the mine’s new South African owners. Join us Monday (25 July) at the London office of MRC investor Graham Edwards, to stand in solidarity with the Xolobeni community and call for an end to the Xolobeni Mineral Sands Project. GRAHAM EDWARDS: Stop the Xolobeni mine! British-backed Australian mining company Mineral Resources Limited (MRC) has quietly announced that it will be divesting its 56% stake in the controversial Xolobeni Mineral Sands Project on South Africa’s Eastern Cape. This seems like a major victory in the local Amadiba community, but with the details of MRC’s divestment far from transparent, major uncertainties remain over the future of a project that aims to exploit a 22-kilometre strip of South Africa’s stunning Wild Coast, and which has already claimed the lives of four mine opponents in the community, while leaving others injured or living in exile. In its statement, released on the Australian Securities Exchange on 18th July, MRC confirmed it will be divesting its shares to one of its ‘black economic empowerment’ partners, Keysha investments. The company’s announcement gave few details on the MRC-Keysha transaction and how it will affect the future of the Xolobeni project. Given these uncertainties, campaigners worry that the move may simply be about deflecting international pressure over the Xolobeni mine, while maintaining a less-obvious ongoing financial stake in the project. Following the money behind the company through blind accounts and shell companies, research by members of the London Mining Network and the Marikana Miners Support Campaign revealed that MRC receives significant financing from London. Specifically, the company is backed by British property magnate, Graham Edwards, CEO of Telereal Trillium. Edwards owns an estimated 23.6% of the company, via a shell company, Au Mining Ltd, for which he is the sole shareholder and beneficiary. Public pressure on Edwards, through a picket outside his London offices and sustained media work, appear to have had an impact. Following MRC’s divestment announcement on Monday, inside sources suggest Edwards played a key role in pushing for MRC to divest. However, unconfirmed reports have also surfaced that Edwards has increased his shareholding in MRC, as campaigners try to understand what the company’s divestment from Xolobeni really means. Divestment: A wolf in sheep’s clothing? In announcing the transfer of its 56% stake in the Xolobeni Mineral Sands Project to Keysha Investments, MRC stated that “the future viability of the Xolobeni Project should be managed by stakeholders and organisations exclusively owned by South African people.” But this statement is not all it seems as the connections between MRC and Keysha run deep. Keysha was set up by MRC as a wholly owned subsidiary of the Xolobeni Empowerment Company (XolCo), which itself was established by MRC and is run by a small pro-mining minority in the Amadiba community. The two active directors of Keysha Investments are Pretoria-based Corporate Law Services, and Mzwandile Maxwell Maraqana. Corporate Law Services is also listed as a director of Blue Bantry Bay, a subsidiary of MRC. The Amadiba Crisis Committee’s legal team, the Legal Resources Centre has stated that Keysha was established by MRC to advance its mining interests and questioned the terms of MRC’s divestment. 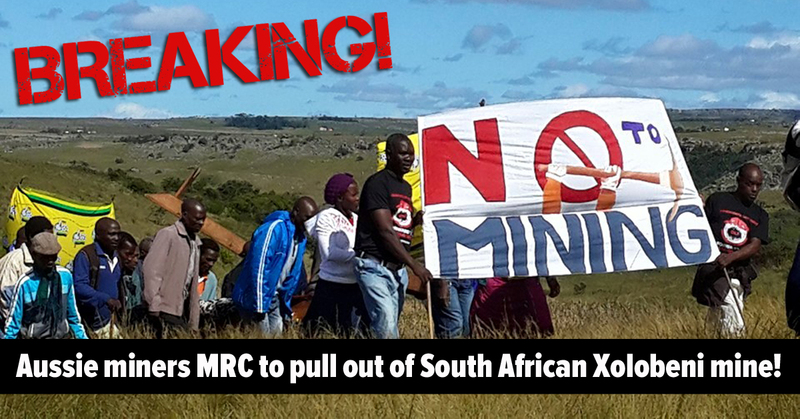 “It is manifestly unclear how this transaction will be funded, and what compensation Keysha will be obliged to pay to MRC and/or its subsidiaries in return for MRC’s interest in the Xolobeni project,” wrote LRC. Greater investigation of the complex web of financial connections between Keysha, XolCo, Blue Bantry and MRC is needed to see if MRC’s divestment is genuine, or simply a ploy to reduce the company’s reputational risk, while still profiting from a mine held at arms-length. Whether or not MRC and Graham Edwards’ interest in the Xolobeni Mineral Sands Project has truly come to an end, MRC’s divestment from the project does not meet the most fundamental demand made by the Amadiba Community. The news of MRC’s apparent divestment reached London the night before the London screening of The Shore Break, a documentary that follows the struggle for the future of Xolobeni. The event was organised by a growing coalition of groups working in solidarity with the Amadiba community, including: London Mining Network, The Gaia Foundation, War on Want, Wretched of the Earth, Movimiento Jaguar Despierto, Front Line Defenders and Marikana Miners Solidarity Campaign. The screening provided an opportunity to discuss what comes next for the campaign with Nonhle Mbuthumba, a community leader and member of the ACC, via Skype. Nonhle emphasised the importance of keeping up the pressure on Graham Edwards as we work to get clarity on what MRC’s divestment means for his role in the Xolobeni project. Next Monday 25 th July we will go to Edwards’ offices to hand in an AVAAZ petition signed by 5,000+ people, calling on him to divest from MRC. We will also hold a demonstration to let Edwards know that we will continue scrutinising MRC’s divestment every step of the way. Join us at 8AM at 140 London Wall and stand in solidarity with the people of Amadiba saying IMINING AIYPHUMELELI! – Mining will not pass!